The Khaki X-Mach  takes Hamilton aviation watches to exhilarating new heights with its facility to measure the Mach number of an aircraft, the speed it is moving through the air divided by the speed of sound under the same atmospheric conditions. This sophisticated chronograph timepiece expresses the inspiration of the skies through relentless attention to detail and bold looks reminiscent of the cockpit. The Khaki X-Mach assures happy landings for its stylish wearer, with a combination of soave elegance and mechanical fascination. Pilots simply set the pressure altitude (PA) and calibrated air speed (CAS) measured by the instrument in the cockpit by turning the left crown of the watch to reveal the Mach number in ISA (International Standard Atmosphere) conditions on the bezel. This transforms the timepiece into a stunning portable Machmeter. For wearers with their feet firmly on the ground, the Hamilton Khaki X-Mach watches increase the exhilaration factor with dynamic, sporty design. Aviation-inspired style elements include wing-shaped metal and carbon-fiber surrounds to protect the crowns, as well as nostalgic flying-jacket style stitching and studs on the bracelet. Tiny red touches, for instance at the tip of one of the counter hands, remind of high-precision cockpit instruments. 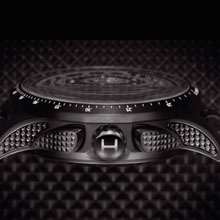 A compass-style arrowhead on the back case symbolizes speed and signs off the ultimate aviator’s style statement. 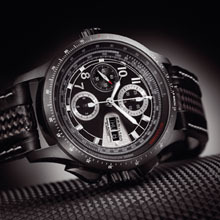 All of the variations of the Hamilton Khaki X-Mach have a smooth black dial with easy to read silver-colored indices and matching counter frames. 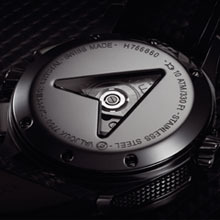 There is a choice of a black or silver-colored case with fine white or black numerical markings around the bezel to give it the look of an altimeter. The date display is at 3 o’clock and framed with a shape resembling the wedge put underneath a plane’s wheels when it is stationary on the tarmac. Its surface is finely decorated with an elegant ‘Clous de Paris’ guilloché pattern. For the bracelet, wearers can either select brown leather to coordinate with the flying jackets, headgear and gloves of yesteryear, or contemporary black leather or rubber attachments. In all of its interpretations, the Khaki X-Mach is ready for take-off, on airport and fashion runways. International Standard Atmosphere (ISA) is an atmospheric model of how the pressure, temperature, density and viscosity of the earth’s atmosphere change over a wide range of altitudes. It consists of tables of values at various altitudes. Calibrated Airspeed (CAS) is a measure of the speed at which an aircraft is moving through the air. Pressure Altitude (PA) is the indicated altitude when an altimeter is set to an agreed baseline pressure setting. This setting – 101,325 Pa, equivalent to 1013.25 millibar (or hectopascals), or 29.92 inches Hg – is equivalent to the air pressure at Mean Sea Level (MSL) in the ISA. Mach Number (Ma or M) is the speed of an object moving through air, or any fluid substance, divided by the speed of sound as it is in that substance. It is commonly used to represent an object's speed, when it is travelling at (or at multiples of) the speed of sound. Mach 1.0 is the speed of sound, Mach 2 is twice the speed of sound etc.